Moon, who has adopted a dovish approach to Pyongyang and brokered the US-North Korea talks process, urged his officials to find out what exactly had gone awry at the high-stakes meeting, and predicted a deal would ultimately be reached. "We hope that both countries will continue their dialogue and that their leaders meet again quickly to reach an agreement that was held off this time," Moon said during a security meeting in Seoul. "While I believe the North-US talks will produce an agreement in the end, I ask officials to work hard for the resumption of working-level talks between the US and the North as it is not favourable to have a long absence or stalemate in talks." The second meeting between US President Donald Trump and the North's Kim Jong Un broke up in disarray Thursday in the Vietnamese capital, without even a joint statement. Trump said at a press conference after the summit that the North Koreans had wanted sanctions against Pyongyang "lifted in their entirety". According to a senior US official, Pyongyang in return offered only to close down "a portion of the Yongbyon complex", a sprawling site covering multiple nuclear facilities -- and the North is believed to have other uranium enrichment plants. North Korea rebuffed the claims, saying it had only wanted some measures eased, and that its proposal to close "all the nuclear production facilities" at Yongbyon was its best and final offer. "I ask that we find out the exact gap between the two sides that led to a no-deal at the Hanoi summit and explore ways to narrow down that gap," Moon said. The UN atomic watchdog said Monday there were indications that Yongbyon's reported centrifuge enrichment facility had been in use as recently as the end of February. "However, without access, the Agency cannot confirm the nature and purpose of these activities," said International Atomic Energy Agency chief Yukiya Amano in Vienna. The IAEA uses methods including satellite imagery to monitor North Korea's nuclear programme. About 100 kilometres (60 miles) north of Pyongyang, Yongbyon is home to the country's first nuclear reactor, and is the only known source of plutonium for the North's weapons programme. 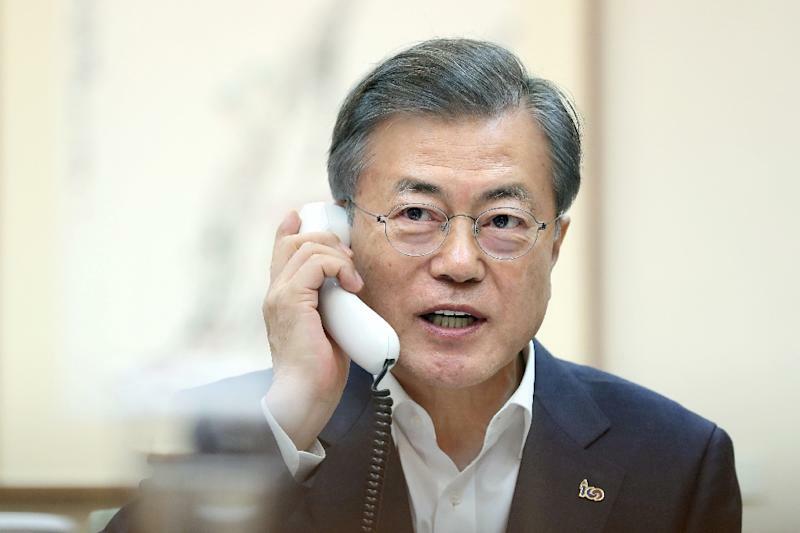 However, Moon said that if all Yongbyon facilities were "terminated in entirety, it should be considered the North's denuclearisation has entered an irreversible stage". The Yongbyon site is "the foundation of North Korean nuclear facilities", he added.